Chicago, IL - Macsteel Service Centers USA installed a high-performance Cassette Leveler/Precision Servo Feed Cut-to-Length Line in its Chicago metal distribution facility. 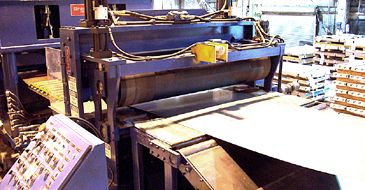 The new Cut-to-Length Line converts 60,000# x 72" wide carbon steel, stainless, and aluminum coil in gauges from .019" through .250" into panel-flat close-tolerance sheets. The CTL Line features a Computer Controlled Two-Cassette Leveler, Precision AC Servo-Feed, and a Hi-Speed Hydraulic Shear. Entry section quickly peels, guides, and threads 72" x .019"/.250" strip to the Cassette Leveler. 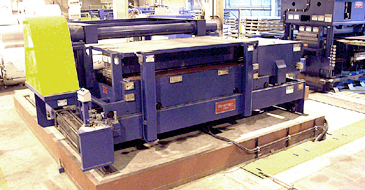 A Guillotine Crop Shear removes coil heads and tails. Hydraulic Cassette Leveler: Macsteel's "Cassette" Leveler produces panel flat laser quality strip throughout a wide gauge and product range. 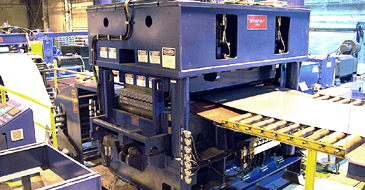 Microprocessor controlled hydraulic back-up cylinders are housed within a massive 4-post Leveler frame into which quick-change Leveler Cassettes are power injected and retracted. All working Leveler parts . . . work rolls, back-up bearings, and drive shafts are installed in a common Cassette housing installed into and removed from the 4-Post Leveler frame. The adjustable Cassette back-up flights are automatically aligned with the hydraulic back-up cylinders when the Cassette is locked in the 4-Post Frame. Work roll drive shafts automatically engage with the Leveler drive gear box as the Cassette is installed. 3" x 5-Hi Cassette installed in the 4-Post Leveler frame. Leveler set-ups based upon coil mechanical properties are automatically accomplished by microprocessor controller. Hydraulic cylinders, rather than mechanical motor-reducer-sliding wedge-screw jacks, accomplish Leveler work roll adjustments. 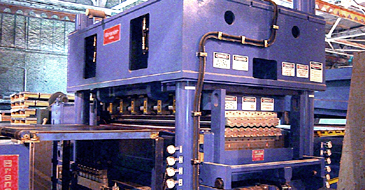 Macsteel's Cassette Leveler employs 14-independently positioned hydraulic cylinders to position the back-up flights. Seven cylinders are installed at the entry, and seven cylinders are installed at the exit end, of each back-up flight. Precision electronic linear transducers are employed to independently position each cylinder. Adjusting the entry end and exit end cylinder elevations causes the work rolls to be "tilted" front-to-back for coil-set correction. Adjusting cylinder elevations from side-to-side accomplishes "roll-bend" for precise edge-wave and center-buckle shape correction. Hydraulic Leveler benefits include elimination of mechanical screw-wedge backlash and maintenance, automatic Leveler set-up, pushbutton set-up memory, automatic Leveler calibration, and bullet-proof reliability. Macsteel's Cassette Leveler is equipped with two (2) Cassettes. A 3.000" x 17-roll x 5-Hi Cassette levels .250"-.060" gauges, and a 1.500" x 17-roll x 6-Hi Cassette is used for leveling .075"-.019" gauges. 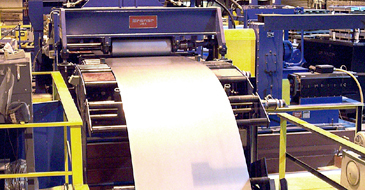 5-Hi and 6-Hi Cassettes allow Macsteel to process surface-critical coated carbon steel, stainless, and aluminum coil. Leveler Cassettes are stored off-line on a-Cassette Injector Car. Cassettes exchange in about 2-minutes. A Power Cassette Maintenance Opener opens a Cassette like a book to expose all working parts for periodic cleaning and maintenance. Servo Feeds compare favorably to "reciprocating hitch feeders" in productivity, reliability, and longevity. Grabbing, releasing, sliding backwards, and re-grabbing consumes the majority of a reciprocating hitch feeder cycle time. By comparison a Servo-Feed simply feeds forward and has few parts that require replacement or repair. The Servo-Feed's quick non-reciprocating operation, low acceleration/deceleration, few moving parts with an absence of chains, screws, clamps, and related mechanical parts makes it an excellent performer with consistent close-tolerance accuracy, low operating cost, and bullet-proof reliability.